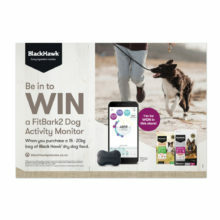 Go in the Draw to WIN A BARKFIT2 DOG ACTIVITY MONITOR, whenever you purchase a 15kg or 20kg bag of Black Hawk Dog Biscuits! T&Cs👉 Starts Friday 1st Feb 2019 and ends 12pm Thursday 28th Feb 2019. Instore promotion only.